It seems like everything in authoritarian countries has been created and established to materialise the phantasies of George Orwell and Franz Kafka. At that, sheer number of various prohibitions and laws far exceeds the number of such countries, causing disbelief in normal and healthy societies. Sometimes these regimes adopt such bills and laws that are confusing and one may not easily understand what punishable acts are. More often than not parts of such laws are interpreted in ways that make no sense whatsoever. Kazakhstan is no exception. 1. Insulting the president, his images or inquiring about his wellbeing. Two laws protect the honour and dignity of Nursultan Nazarbayev at the same time: the laws on the president and the leader of the nation. So insulting the president and other infringements on his honour and dignity as well as “defacement of his images” are criminal acts. Fortunately, it has been a long time since the last perpetrator was held accountable for such crimes. However, the country’s history still records the names of Madel Ismailov, the leader of a workers’ movement, who was imprisoned for one year as well as publicists Karishali Asanov and Jasaral Kaunyshalin and journalists Kazis Toguzbayev who were only sentenced to conditional terms for their critical or humorous statements. On the other hand, even Google does not have the name of a discontented resident in Yuzhno-Kazakhstan Region, who has vandalised an election banner with then-presidential candidate Nazarbayev’s image and was therefore sentenced to one year of imprisonment. For those curious ones among you: the law on state secrets prohibits citizens from inquiring about the health of the president and members of his family; at least the government was unable to charge anyone with this as of yet. That said, the president’s own press service has recently flopped and uncovered a state secret: President Nazarbayev caught cold recently. No information on repressions of informants has been made available. All in all, a quite paradoxical situation is shaping up at this time. On the one hand, social networks are full of “de-motivators” and other online products on the president, but none of those jokers is held accountable. 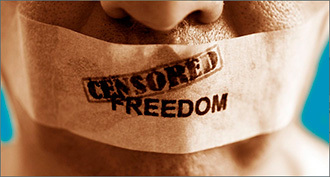 Most likely, the article in question is not easily applicable: the offender of the leader of the nation is automatically included into a list of those politically persecuted or convicted, and the society is thrown into the never-ending cycle of debating about the boundary between free speech and insult yet again. That is why the Kazakh lawmakers have come up with many other articles that can be used to press charges and leave the sacred presidential name alone. By the way, insulting the president can entail being beaten up by “completely accidental passers-by” even though this form of punishment is not prescribed by law. 2. Speaking openly in social networks. The nightmare of social networks over the last several years has been “inciting discord and animosity” provided for in Article 174 of the Crime Code, which is applied on some 100 criminal investigations every year. While only 10 or so per cent of such cases are actually tried, the very possibility of being imprisoned for a long term for stupidity—sometimes for simply expressing your opinion—did impact the online community in Kazakhstan. The most unpleasant part of this process is that even those involved experts are unable to definitely say whether animosity incitement has actually taken place. That is why, just to be on the safe side, they write “indications” of this are present; judges and investigators then fill those blanks in. The latter, by the way, are in constant competition with each to prove their loyalty. That is the reason why the last year’s controversial case involving Maks Bokayev and Talgat Ayan, civil activists in Atyrau, has resulted in their conviction in part for “inciting social discord” because the court thought criticising officials was just that. Thus, the Kazakh officials are now a separate social class thanks to this judge’s ruling. While “inciting racial or social animosity” is primarily used to eliminate political opponents or people extra active on social networks, charging people with “religious discord incitement” makes people think whether law-enforcers are mentally healthy. For instance, claiming there is no God could be ground for launching a criminal investigation just like claiming God exists. While Jehovah’s Witnesses and atheists may not necessarily be tried in the same court, they could potentially meet in prison. Criminal investigation has been launched for the second time against Aleksandr Kharlamov, a local human rights in the eastern town of Ridder. While the actual causes might be different, but his atheistic views were the main reason. Well, at least he is still free unlike two Jehovah’s Witnesses who have been confined in a pre-trial detention facility as if they were extra dangerous criminal suspects. They both fell victim to traps secret services laid, pretending to be people interested in their religion and having duped them into saying things that can be qualified as crime if the latter apply necessary efforts. Consequently, the aforementioned rule leads to the following one: 3. Openly demonstrating religious preferences. Belief devoid of local authorities’ sanction could potentially result in a fine or administrative arrest. Believing (or not) in God is better in special facilities erected for that particular purpose. It is also advised to do so quietly and not involving anyone around in your personal relationships with the Almighty. The Kazakh police perceive the Biblical statement “For where two or three gather in my name, there am I with them” as a directive to act; specifically, to prevent that very “I” from appearing in the society unsanctioned. At this time, power-wielding agencies are regularly raiding Baptists and other Protestant sect members, who gather in individuals’ houses because their religious associations are not officially registered. But even official state registration does not shield believers from unwarranted government attention. Because practicing any religious activity and rite requires informing local authorities, and ritual can mean anything from celebrating Christmas to yoga. Any conversations about the existence of God outside religious facilities are considered “illegal proselytizing.” That said, however strange that might seem, even conversations on belief held inside churches have become reasons for fines when held among individuals not granted the status of a missionary. For instance, a Russian witness of Jehovah was convicted in 2014. The officially recognised religions in the country—Sunni Islam, Orthodox Christianity, Catholicism, Buddhism and Judaism—are free from extra attention. On the other hand, “non-traditional” religions and their places of worship are infested with officials, informants and agents. In case there is nothing to find fault with, but doing so is absolutely necessary, they apply articles that have nothing to do with religious activity. In 2013, Krishna followers’ meeting in a public building in Kostanay was cancelled halfway through thanks to efforts of police. And because they had to explain this arbitrariness, they announced the Krishnaites were engaged in an unsanctioned rally indoors. Henceforth, 4. Don’t assemble. The concept of “assembly of more than three is prohibited” no longer bears any meaning in Kazakhstan. Because gathering of more than two is impressible. Moreover, citizens may no longer discuss the possibilities of gathering for any public protest activity—doing so will be deemed as having been committed already; journalists are also advised against showing up at the perceived assembly points. The law on peaceful assemblies does not meet the requirements of either the Constitution, yes, that very document that guarantees everyone’s right for peaceful assembly, or the international laws, whose effect, again, are guaranteed by that very Constitution. However, sometimes protesters do manage to assembly sometimes. After all, protest attitudes are on the rise throughout the country. This situation is resulting in steeper penalties for unsanctioned rallies; those who helped with transportation, logistics or print material are held accountable under the same law. By the way, going on hunger strikes is also prohibited in Kazakhstan. In other words, malnutrition is fine; in fact, that is how tens of thousands of citizens live anyway. Going hungry for political reasons is what is prohibited. That is the reason why members of a union of oil and gas companies employees were tried for “rallying” even though they declared a hunger strike to protest their trade union’s closure. That said, they fulfilled all of their contractual obligations, and simply refused to consume food. In addition to the fact that any group that remotely resembles a protest rally is equated to an illegal assembly, Kazakh policemen do not always know what rallying means, and embarrass themselves sometimes. For instance, Kostanay police disrupted a promotional advertisement while their colleagues in Almaty prevented a running competition; there are tens of other examples when police displayed such vigilance and servitude throughout the country. Theatrical scenes, flash mobs, arts performances and other such assemblies are in direct violation of the law in valiant law-enforcement agents’ eyes. Well, getting together in flats is so far allowed provided certain limitations are observed. 5. Assembling without registration. As is the case with religious communities, initiative groups are not to express whatever interests they might be harbouring. Allow me to remind you about the administrative code, which can gently break apart any community and unity if it warrants slightest suspect. Although the authorities are not extra persistent in this regard: they realise interest-based clubs do not necessarily pose threat to stability. However, if likeminded individuals do express their adherence and choice of democracy, problems shall be abounding. The first and most known “victim of democracy” is ex-Premier Akejan Kajegeldin, who joined the opposition and announced his presidential ambitions ahead of elections. The former official’s ambitions were curbed rather quickly, having labelled his meeting with supporters an illegal assembly of an unregistered organisation’s members. Although nobody was imprisoned, the administrative conviction was a valid and legal excuse to remove Nazarbayev’s would-be competitor from the presidential race. Oh, and fair elections—yes, those didn’t happen that time around either. There are numerous examples, but I decided to speak of the latest as a sample of what has been happening for a very long time. 6. Living without registration. Registration is something absolutely everyone—not only mass media, religious and public unions—is required to have in Kazakhstan; foreigners in Kazakhstan are required to register at places of residence. That said, Russian citizens are allowed to sojourn during the first 30 days with no registration, whereas other countries’ citizens are given five days to complete this procedure. The lack of this unnecessary stamp in one’s passport will result in significant fines. Even against this backdrop the Kazakh authorities do not tire to dream about becoming a tourism haven. Meanwhile, the authorities are more suspicious of their own citizens. The Kazakh government has surprised the citizens with a New Year’s gift: each citizen must register at the place of temporary residence if they plan to do so over a period exceeding one month. The “gift” led to panic, chaos and death in queues because this is the only way local officials organise their work. Given the fact that Kazakhstan is a country of nomads, wherein millions can simply pack up and take off in search for a better life, such fines alone would perhaps be enough to mend the holes in the state budget. So perhaps confusion and uncertainty may have been premeditated in this matter, eying a profit in the form of long queues of those who unavoidably will violate this rule. By now, there is a dozen of convicts charged and convicted for premeditated or unpremeditated transmission of unverified information. The first person to go behind bars for 2,5 years was an Astana resident for reporting on alleged disorderly conduct in a market. He was later joined by the two aforementioned human rights activists, Maks Bokayev and Talgat Ayan. Among other charges, they were charged with “dissemination of false information” about the possible sale of land to foreigners. That said, they were only repeating what officials of highest ranks have been saying already. By the way, information on the death, significant illness anyway, of the president was actively discussed in social networks for an entire day quite recently. While the rumours were disseminated in a vague manner, pertinent agencies wouldn’t have difficulty identifying the sources. Because there was no one publicly reprimanded for this, it is quite possible the information was thrown out there to identify those Internet users who’d make unusually high-spirited responses to the news. 8. Do not post online without thinking it over first. Otherwise your posts can be used against you. According to an ill-thought law on introducing amendments on information and communication networks, absolutely all internet resources are equal to conventional mass media. This status, consequently, makes bloggers and other Internet users journalists. At the official level, journalists and mass media employees in Kazakhstan do enjoy some advantages when it comes to the right to collect information. However, not a single person in the whole army of “web-based journalists” was able to use this opportunity. And on the other hand, some of such “journalists” have been held accountable to the full extent for violating laws on mass media. The last person, so far, to have been convicted in such a case was a human rights activist in Baykonur, who suspected the mayor was distributing land to “respected people.” A year-long imprisonment turned out to be sufficient for everyone to learn a lesson: the rights activist was released thanks to amnesty; the mayor was happy his critic had been punished; the judge was happy he issued a Solomonesque ruling. 9. Bringing Internet-connected devices to government buildings. The prohibition was introduced in the spring of 2016, and aimed at preventing leaks of state secrets. That said, there is administrative or criminal liability for doing so. It is clear that no secrets were actually leaked in this manner, but photos and videos made with such devices allowed regular Kazakh citizens to see a whole lot of un-presentable things and actions in the lives of public servants. Even though the directive would only cover government employees, guards at such facilities force the majority of visitors to check their devices upon entrance. The worst off in such situations are journalists and lawyers, because they are “toothless” and “disarmed” when they enter courthouses and government buildings. 10. Speaking badly of Kazakhstan while abroad. The law on national security lists one such threat among others: damaging national interests, political image and economic rating of Kazakhstan on the international level. In other words, you cannot speak the truth while “out there,” but you can do so while home. And what to do with the Internet? You can pour dirt on the country’s image on .kz website, but can’t do so on a foreign one? And is that okay that the Internet is not limited to political geographical borders?.. Thankfully this novelty has not made its way into the Crime Code, or this very article you are reading would land its author in very hot waters with the law. On the other hand, it is seems hardly likely that someone could inflict more damage than that already inflicted by the Kazakh authorities’ actions, decisions, rulings and laws. They seem to understand that themselves.